With only 8 days before the banquet, we have had 371 people register. We continue to pray that you will “engage” with us. The deadline to register for this year’s banquet is Wednesday, February 13. As God continues to provide for the evening through our generous table sponsors, their investment is allowing money raised through the Heritage Banquet to support the internal workings of the school. The internal needs of the school include classroom technology, teacher training, curriculum development, and elementary playground needs. These internal needs are the heartbeat of the school and directly “engage” students in learning. 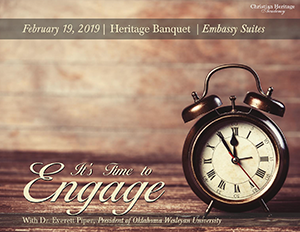 We pray that you will consider how God might have you invest in CHA through the Heritage Banquet. We would also like to invite you to our student art auction preceding the banquet beginning at 5:30pm. Proceeds from the art auction will support our visual arts department. Many of the art pieces are displayed in the main hall of the elementary wing. Bidding has begun in the elementary office. Final bids will be received the night of the banquet. The VIP event begins at 5:45pm. Banquet hall doors will open at 6:00pm. To register for the event or for information on being a table sponsors for the event, please visit here. Please remember that prospective families are free. To register a new prospective family, please contact Babs Lewis, Development Assistant. Thank you to our 2019 Heritage Banquet Table Sponsors! Now is the time to engage!